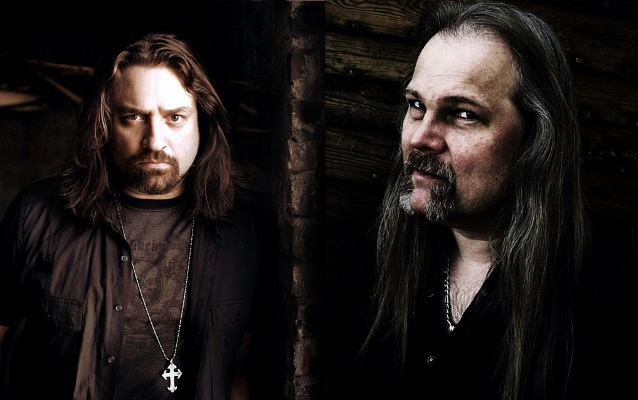 After some four years, The Great Divide marks the return of the two powerful heavy metal vocalists in duet, Symphony X's Russell Allen and solo artist Jorn Lande. It's quite a remarkable thing when you think about. In an 2012 Allen commented upon future albums and his relationship with Lande saying, "I don't know what he's up to. We don't talk, we have no relationship, really, so I don't know what he's up to ... I do like doing records with him, because it's easy, the songs are great and his voice is great, and I always look forward to doing it." I'm not sure how this works, how three, now four, albums have been made together, and the two vocalists neither know each other nor talk. Strange. I guess former Stratovarius member Timo Tolkki, new to the Allen/Lande project, writes the songs, records the music, and then passes them to each vocalist (probably digitally via the Internet). Viola! Another Allen/Lande album appears, and nobody had to be in the same room. What you need to know about The Great Divide is that, as expected, there are some terrific melodic heavy metal songs and both Allen and Lande are at the top of their game. However, I will add that, to these ears, Lande has the upper hand over Allen across this album. The album is rather heavy notably in the bottom end, but also from some major Tolkki riffage. The title cut is particularly pummeling and thundering. Even the metal ballad Bittersweet hits deep and hard, though it has some delicate piano in the intro and outro to trip you up. Yet with Tolkki behind the songwriting you can expect some true rock groove along the way, and some darn catchy hooks, whether by lyrics, arrangement, or his guitar solos. Come Dream With Me, The Hymn to the Fallen, and the uber-catchy Reaching For The Stars are heavy metal rockers. After all this, and several listens, I found something to be slightly disturbing. The more I listened the more The Great Divide began to sound less like an Allen/Lande album and more like the next Jorn album. I'd be curious, after the album is in their hands, if other listeners might feel the same way. Regardless, The Great Divide is still another solid platter of heavier melodic power metal from the Allen and Lande partnership. The Great Divide is another solid platter of heavier melodic power metal from the Allen and Lande partnership.